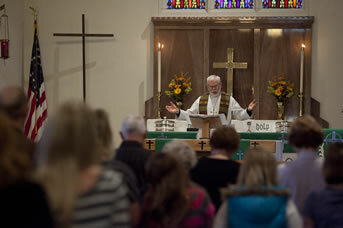 Worship is central to the life of Estherville Lutheran Church. 100+ people gather each weekend to praise our God and to hear the Good News of God’s love for us. Most weeks Holy Communion is celebrated at both services and is open to all who wish to receive this gift of life. One of the best definitions of worship is “twittering time away with God.” As eternal children of God, claimed as God’s children in Holy Baptism, we believe we have more “than all the time in the world” and so we gather to sing praises to God, hear the scriptures read and the Good News of God’s love preached receive the gift of life in Holy Communion and respond with our tithes, offerings and prayers in thanksgiving for all God has done for us. 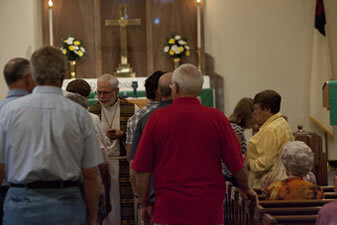 Every Saturday evening a group of people gather in the chapel for an informal worship service. 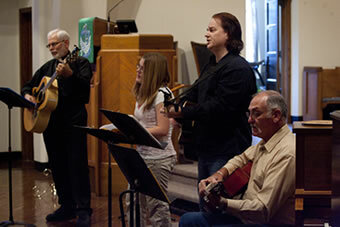 The Worship Band leads the music and a less formal order of worship is followed than on Sunday. Feel free to come to this service dressed informally or if you work on Saturdays, come from work. 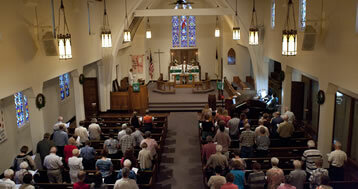 As with most congregations Sunday morning worship is the largest weekly worship service. 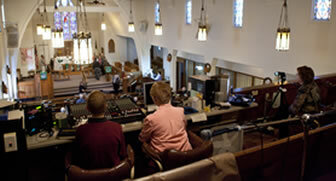 We have a pipe organ which is used to lead the singing, persons from the congregation assist in worship as greeters, ushers, lectors and acolytes. Come join us in worship. All are welcome! The 9:30 Sunday service is recorded each week and is made available on the following Sunday at 8:30 am on KILR radio and on the local cable channel 3.